Amidst an aggressive BJP and RSS in Kerala, especially state party chief Kummanam Rajasekharan, calling the famous farmers' Malabar rebellion of 1921, also known as Moplah rebellion, “the first jihadi massacre”, facts have come to light suggesting that a powerful Muslim family from Maharashtra which was helping the rebels was also funding the freedom struggle. A top site from Malegaon, contesting the BJP-RSS claim, has said that businessman Maulana Abdul Qadir Kasuri rushed his younger brother Abdullah Kasuri and two sons Mohiuddin Ahmed Kasuri and Mohammad Ali Kasuri to Calicut in Kerala to provide relief to the Moplahs and establish for them one of the oldest orphanages for the Moplah victims on over 50 acres of land but also funded the freedom movement. Born in April 1889, Mohiuddin Ahmed Kasuri, reveals the site, was not only a close associate of freedom fighter and India’s first education Minister Maulana Abul Kalaam Azad. Kasuri. Kasuri, who met Maulana Azad in July 1916 in Ranchi Jail, after which he was detained by the British government in Hoshiarpur till 1919, established businesses in Bombay. Says the site, "The profit earned from these businesses related to salt, textiles and leather industries were used to fund its charity institutions established in Calicut and Pune." Further, quoting historical sources, it notes, "The family donated for years Rs 100,000 annually to Maulana Abul Kalam Azad as fund to be used for India’s freedom struggle”. It is quite another thing that after Partition, adds the site, "the Kasuri family moved to Pakistan", adding, "Former Foreign Minister of Pakistan Khurshid Mahmud Kasuri in Pervez Musharraf’s cabinet belonged to the same family." Rajasekharan's allegation, which led to a huge controversy across India, was made at the BJP’s Jan Raksha Yatra even as it entered the Muslim-dominated Malappuram district in Kerala early this month. “If it were an agitation against British rule, why were thousands of people butchered and temples destroyed? It high time we stopped glorifying this massacre depicting it as freedom struggle. If anyone is given pension on behalf of this rebellion, it should be given to those who had to flee their homes during the riot and the dependents of the victims of the jihadi massacre”, the BJP leader said. 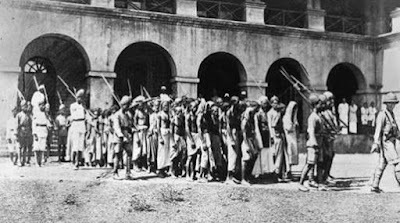 The Malabar rebellion or Moplah rebellion of 1921 is widely considered and understood as an uprising of Muslims tenants against the British government and Hindu landlords, and the culmination of a series of revolts that recurred throughout the 19th century and early 20th century. During the rebellion, says the site in an article authored by its founding editor Aleem Faizee, "The Mappilas attacked and took control of police stations, British government offices, courts and government treasuries. The Hindus loyal to the British rule also came under attack." Faizee adds, "It is because of this the right wing Hindu extremists and biased British historians to sow the seeds of communal divide gave it a communal colour claiming 'fight against the British ended up as large-scale massacre and persecution of Hindus'." "According to the Kerala government’s own admission, the British government put down the rebellion with an iron fist, British and Gurkha regiments were sent to the area and Martial Law imposed", says Faizee, adding, “One of the most noteworthy events during the suppression later came to be known as the Wagon tragedy, in which 61 out of a total of 90 Mappila prisoners destined for the Central Prison in Podanur suffocatewd to death in a closed railway goods wagon”, quoting a Kerala government website. "The Moplah Muslims and others involved in the uprising were continuously in touch with the national leaders leading the freedom struggle. These leaders were shaken by the reports of the persecution of Moplahs at the hands of the British forces", Faizee says, adding, "They became restless and started searching for means to provide relief", something which came from the Kasuri family.